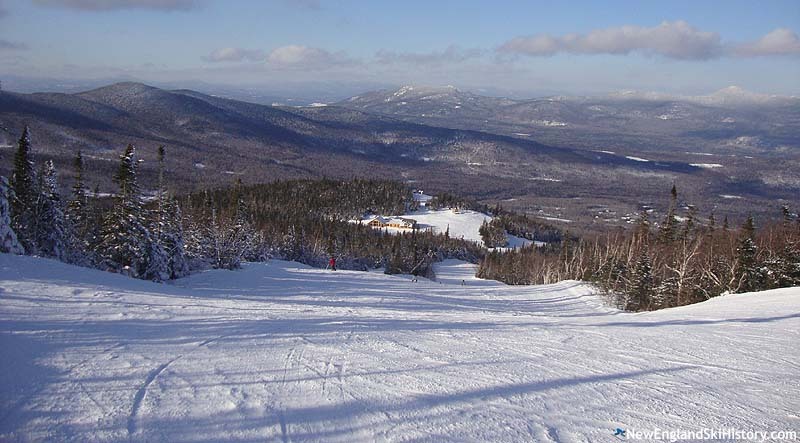 Located in the Longfellow Mountains in western Maine, Sugarloaf is one of the largest ski areas in the Northeastern United States. 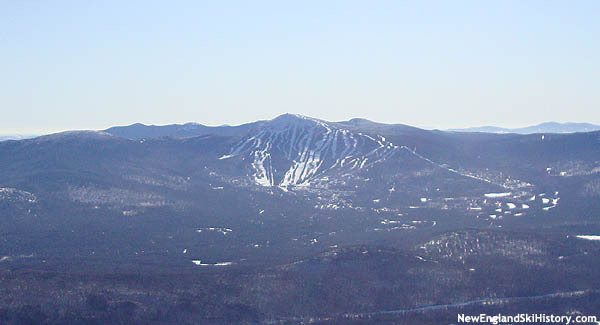 The scrubby upper elevations of 4,250 foot Sugarloaf Mountain feature unique snowfields in the winter and spring months. 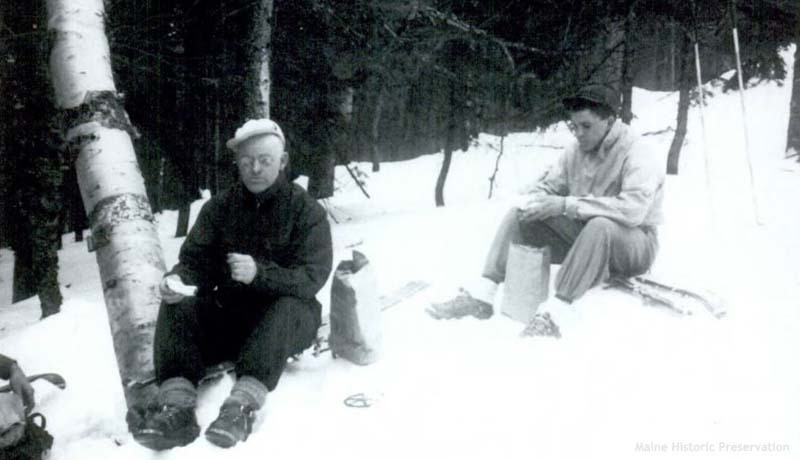 After being picked by the Maine Ski Council, development of Sugarloaf Mountain started in 1950 when the Sugarloaf Mountain Ski Club negotiated a 20 year lease with Great Northern Paper Company for land on the northern face of the mountain. Starting that summer, Winter's Way (named after local organizer Amos Winter), was laid out by Sel Hannah, dropping some 1,800 vertical feet from the summit snow fields. The trail was completed in January of 1951 and was skied that winter. The 1951 off season was spent smoothing the trail as well as improving the access road. A base hut was constructed in 1952. Sugarloaf's lift served history started in 1953 when a 700 foot rope tow was installed at the bottom of Winter's Way, while a shelter was constructed near the top. The Sugarloaf Mountain Corporation was formed in March of 1955, naming Robert "Bunny" Bass president and Amos Winter executive manager. $100,000 of stock was authorized for sale, eventually paving the way for the signing of a contract with E. G. Constam Company in July for a new T-Bar. For the 1955-56 season, the T-Bar debuted along with the Narrow Gauge trail and a base lodge. Following a successful 1955-56 season, additional investments were made in the ski area. An upper mountain T-Bar was installed, providing over a mile of uphill service with the lower T-Bar. The base lodge was also expanded to help with the growing crowds, while the Tote Road trail opened. While the 1956-67 season was one of poor snowfall, 1957-58 was epic. At the end of the 1950s, Dan Kiley was hired to conduct a land study of Sugarloaf, resulting in a major five year expansion plan. Then first phase of the plan was rolled out in 1959 when $90,000 was invested in the ski area. To help ease congestion and better position for future expansion, the base area was moved downhill to a new base lodge. A new T-Bar was constructed, serving a new novice slope, as well as providing access to the existing tandem T-Bars. For the 1960-61 season, the new base lodge was expanded and the Double Bitter trail cut. That spring, a young literary student named John Christie visited Sugarloaf with some friends and quickly became a ski patroller and bartender. He stayed in town that summer and helped with the installation of two new T-Bars and the cutting of new trails. The expansion allowed for a second set of tandem T-Bars to the base of the snow fields. 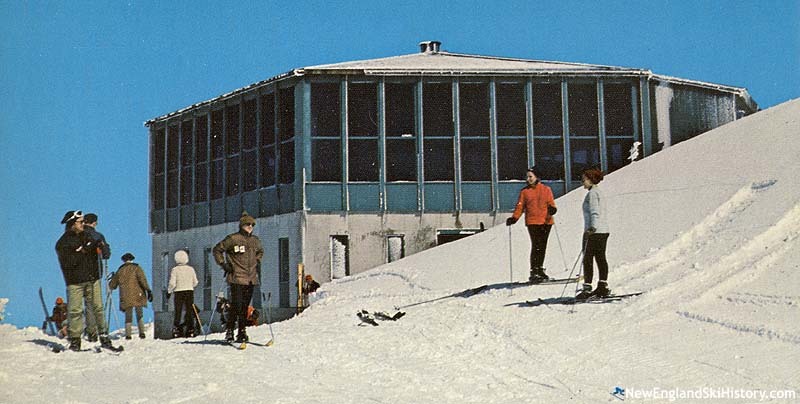 For the 1963-64 season, the original T-Bar was refurbished and extended down to the newer base area, while an addition to the base lodge was constructed (and the original base lodge demolished). The new lift configuration allowed base to snowfield access with only two lift rides. By this time, the ski area sported 12 trails and an uphill capacity of 5,000 skiers per hour. A massive transformation of the ski area was commenced in 1964 when John Christie laid out a top to bottom lift line. Later that year, the decision was made to purchase a two-stage Pohlig-Heckel-Bleichert (PHB) four person gondola, both for high capacity ski lift service as well as potential summer operations. With Christie assuming General Manager duties from Amos Winter (who remained a fixture at the mountain another decade and a half), installation started in 1965 and continued into January of 1966. The lift was formally dedicated on February 4th, 1966, making the newly-branded Sugarloaf/USA an internationally recognized ski area. The hype was so big that the ski area was being considered as a potential site of the 1976 Winter Olympics. 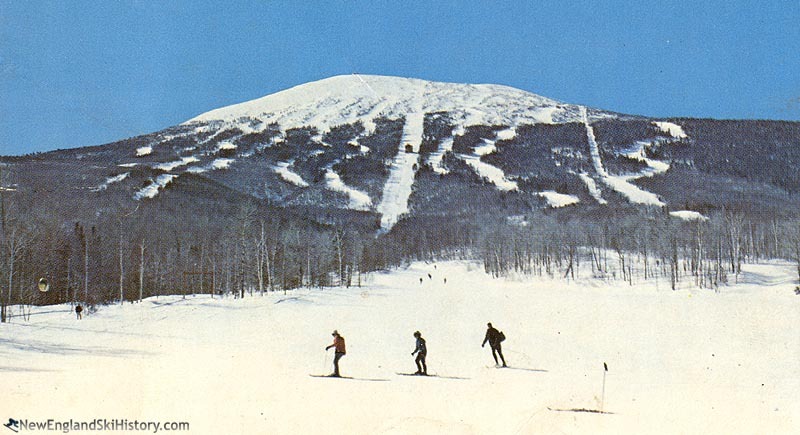 The 1965-66 season was Sugarloaf's biggest at that point in terms of skier visits and revenue. The summit lodge was completed and a 45 meter ski jump constructed for the 1966-67 season, as Sugarloaf prepared to host the NCAA Intercollegiate Skiing Championships, as well as the first World Heavyweight Ski Championships. Harry Baxter was recruited from Mt. Whitter, NH as the new Ski School Director. John Christie departed for Mt. Snow, VT following the 1967-68 season, at which point Baxter took over as General Manager of Sugarloaf. Sugarloaf's first chairlift was installed for the 1969-70 season, serving the new Bucksaw area. A second double chairlift followed for 1970-71, connecting the newly-purchased Sugarloaf Inn with the base area. World Cup racing was hosted at Sugarloaf that winter. The Timberline T-Bar was installed for the 1971-72 season, providing an all-T-Bar route to the summit area from the base of the ski area. Construction on Village Center commenced in 1972, further moving Sugarloaf into destination resort status. Meanwhile, land was purchased on Burnt Mountain and an option for nearby Crocker Mountain. The first half of the Double Runner double-double chairlift was completed for the 1973-74 season. While the winter of 1973-74 proved to be a disaster for ski areas across New England, it was particularly hard on Sugarloaf. Lacking snowmaking, the area sustained a loss of $480,000. Nonetheless, Sugarloaf was able to gather $500,000 to push through much needed projects during the summer of 1974. The second half of the Double Runner was completed, providing chairlift service to the novice Boardwalk slope. More importantly, a top to bottom snowmaking system was installed, reportedly covering the most vertical feet in the world. Included in the initial system were 3 miles of pipe, 4 pumps, and 3 compressors. The east side of the Spillway double-double was installed in 1975, connecting the Double Runner chairs with the upper mountain. The Appalachian Trail was relocated off the summit and ski slopes of Sugarloaf a year later, thus helping the ski area avoid potential developmental roadblocks in the future. The next sizable expansion took place in 1981, when the Timberwind double chairlift was installed below the Sugarloaf Inn, further increasing Sugarloaf's vertical drop. On January 5, 1982, Sugarloaf founder Amos Winter passed away at the age of 80. The snowmaking system was also significantly expanded during the 1982 off season, while new base facilities and condominiums were constructed, rounding out a $6 million project. The west half of the Spillway double-double was added for the 1983-84 season, while the Timberline T-Bar may have been retired around this time. The season was fairly successful, resulting in a $601,000 profit. West Mountain debuted for 1984, providing a new base area adjacent to the golf course development. Following the 1984-85 season, the short-lived Timberwind double chairlift was removed and replaced with Sugarloaf's first triple chairlift, the Snubber. Meanwhile, Sugarloaf was experiencing significant financial difficulties. The 1984-85 season resulted in a loss of $394,000 and a corporate restructuring. Nevertheless, the golf course opened and construction began on the $8.5 million Sugarloaf Hotel. On March 23, 1986, the Sugarloaf Mountain Corporation filed for Chapter 11 federal bankruptcy protection, citing too much of an emphasis on real estate development. Warren Cook became president of the Sugarloaf Mountain Corporation that off-season. The court allowed Sugarloaf to borrow an additional $2.5 million to improve snowmaking and terrain for the 1986-87 season. On February 3, 1987, a counterweight cable snapped on the gondola, resulting two injuries. $3 million was invested in new lifts, trails, and snowmaking for the 1988-89 season. The aging Whiffletree T-Bar was replaced with a new fixed grip quad, dramatically improving access to the eastern side of the ski area. Terrain was reworked above this lift to form the King Pine Bowl, served by another new fixed grip quad. Finally, the No. 1 T-Bar was replaced with a short double chairlift. The 1988-89 season was a struggle for Sugarloaf, as below snowfall resulted in a worsening financial situation. The signature gondola remained closed all winter. While Sugarloaf was able to emerge from Chapter 11, losses continued. In 1992, the groundwork was laid to restructure the corporation to allow for a viable long term operation. Sugarloaf was able to dump its wastewater treatment plant, obtain new financing, and receive other write offs, thanks to the help of Carrabassett Valley, the Finance Authority of Maine, and Fleet Bank. The restructuring paved the way to massive changes in 1994. A majority holding in Sugarloaf was purchased by S-K-I Ltd. on August 24, 1994 for $2 million. With the shift in debt and ownership, Sugarloaf was able to invest $4.5 million in lift improvements, including the SuperQuad. At 6,655 feet in length, the new high speed detachable quad was the longest of its type in the East. S-K-I Ltd. merged with LBO Resort Enterprises Corp. on June 28, 1996, resulting in the formation of American Skiing Company. American Skiing Company acquired the remaining 49% of the Sugarloaf stock from Warren Cook that off-season, thus assuming full control of the ski area. American Skiing Company installed the Whiffletree high speed detachable quad for the 1997-98 season, thus providing two high speed options out of the base area. The fixed grip Whiffletree quad was relocated to the top of the mountain as the Timberline Quad. Meanwhile, much of the gondola was removed. Unfortunately for Sugarloaf, American Skiing Company was sinking into deep financial trouble. As a result, large scale improvements ceased and deferred maintenance accumulated. Warren Cook stepped down in 1999. Two years later, American Skiing Company CEO Les Otten resigned. In January of 2005, longtime Sugarloaf skier Paul Schipper's quarter century long streak of skiing on every day of operations ended at 3,903 days. Schipper passed away in 2009, just short of his 86th birthday. 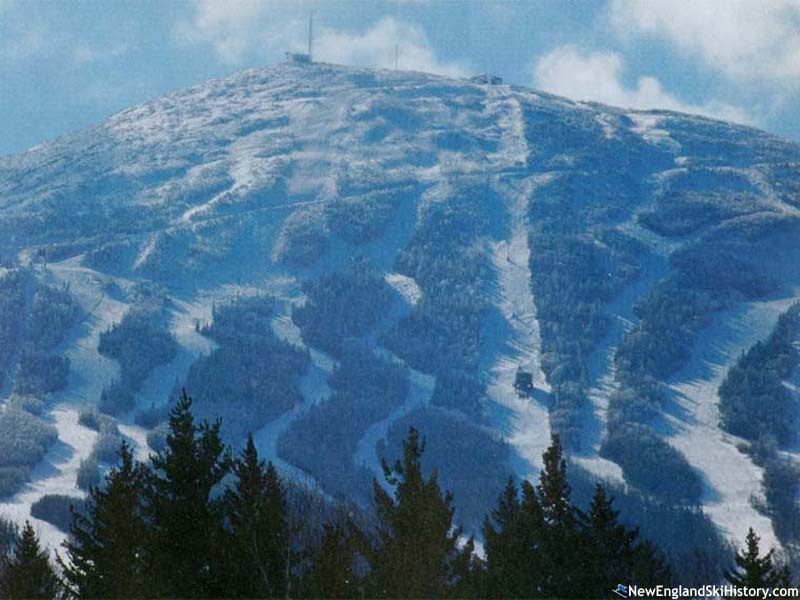 On August 8, 2007, Sugarloaf and Sunday River were sold to Boyne USA Resorts for $77 million. Boyne immediately sold the assets to CNL Lifestyle Properties while retaining an operating lease. During the summer of 2010, maps of the Sugarloaf 2020 proposal emerged, showing a bold decade of expansion. The first phase of the proposal, known as Brackett Basin, was rolled out for the 2010-2011 season. On December 28, 2010, the Spillway East chairlift deroped, sending eight passengers to the hospital. The Spillway lifts were removed after that season and replaced with a $3 million fixed grip quad. $1 million was invested in additional snowmaking equipment for the 2012-2013, while glade development continued in Brackett Basin. $1.7 million was also invested in irrigation improvements at the golf course. Continuing beyond Brackett Basin, the Burnt Mountain area debuted for the 2013-14 season. Sugarloaf hosted the US Alpine Championships in March of 2015. Unfortunately, Sugarloaf's primary headlines that month revolved around the rollback of the King Pine Quad chairlift, the area's second lift failure in half a decade. As a result of the incident, Sugarloaf replaced the King Pine base terminal for the 2016-17 season. Former General Manager and author of The Story of Sugarloaf John Christie passed away on May 7, 2016. For the 2017-18 season, two snowcats were purchased to provide cat skiing on Burnt Mountain. In May 2018, Boyne USA Resorts acquired the assets of Sugarloaf, putting operational control and ownership under one company. "It's a shame they can't rebuild another gondola in the same location as the first. It would generate so much money for the mountain and would be a lot safer to ride than some of the ageing double lifts that have been around for years. " "I grew up skiing sugarloaf! A great memory of mine was the blizzard of 2017. When I looked out my window that morning, all I could see was snow! It snowed 2 and a half feet overnight and snowed another foot all day. First tracks in cant dog and max headroom I will remember forever!!!!"